Most common question we got? "Is a camera lucida like a camera obscura?" The camera lucida and camera obscura: what’s the difference? The camera lucida is an optical device which merges an image of a scene and the artist’s hand on paper for tracing. By contrast, the camera obscura is an optical device that projects a realtime image through a small pinhole (or lens) into a darkened room. The “camera” in the name is latin for “chamber”. This is where we get the word “camera” from when referring to the photographic device. (“Camera” still means “room” in Italian, which is why Italians call your point-and-shoot a “macchina fotografica”—photographic machine). As the leaves overlap, tiny pinholes form in the tiny gaps between the foliage. The crescent shape of the eclipse is transmitted through the pinholes. What you see is not merely sunlight through the leaves, but an image of the sun projected through the leaves. Aristotle describes this precise phenomenon in his Problems, Book XV. The artist stands in the middle at E. But instead of the projection entering the artist’s space, a translucent screen intercepts the inverted image. The artist traces the image as a rear projection of the scene. This has the advantage of eliminating the left-to-right reversal of the image, but it is still upside-down. The artist must also draw on this specific material to maintain the translucency, most likely to transfer to another final surface. 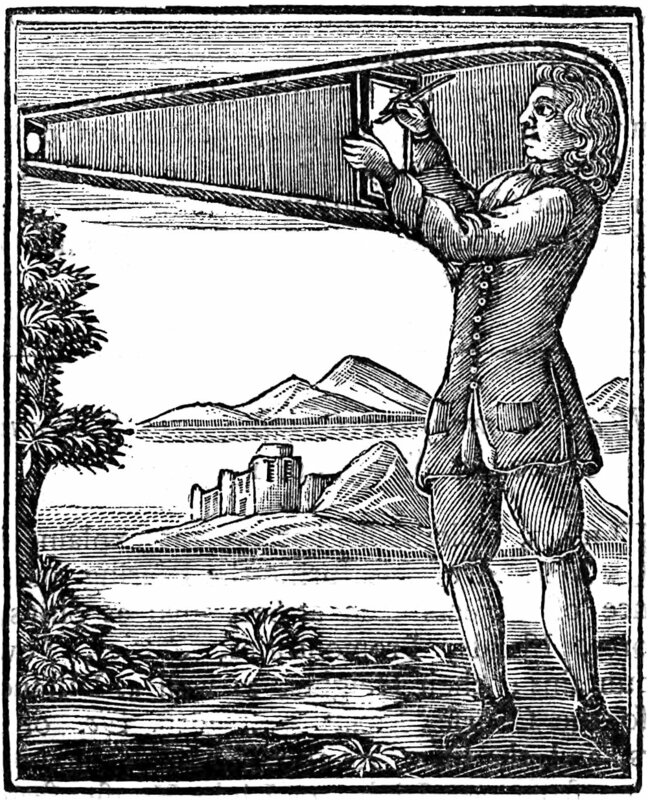 Sir Robert Hooke suggests a “wearable” camera obscura he calls a “Picture Box” (1694). 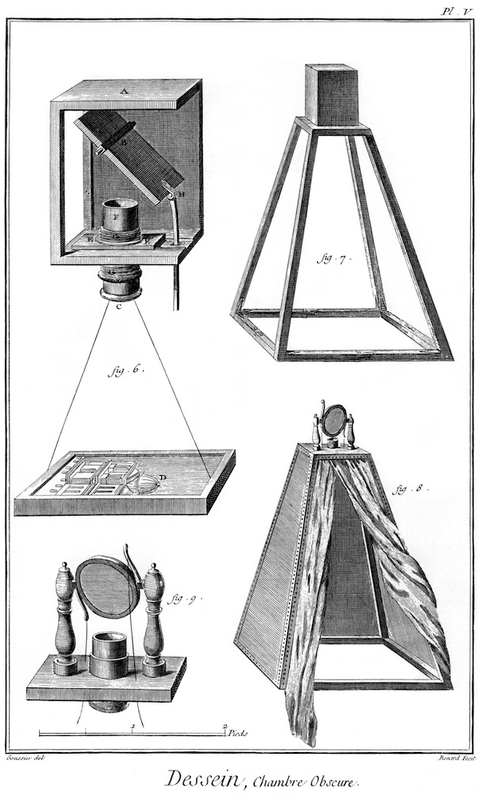 Denis Diderot, entry for Camera Obscura in L’Encyclopedie (1762). 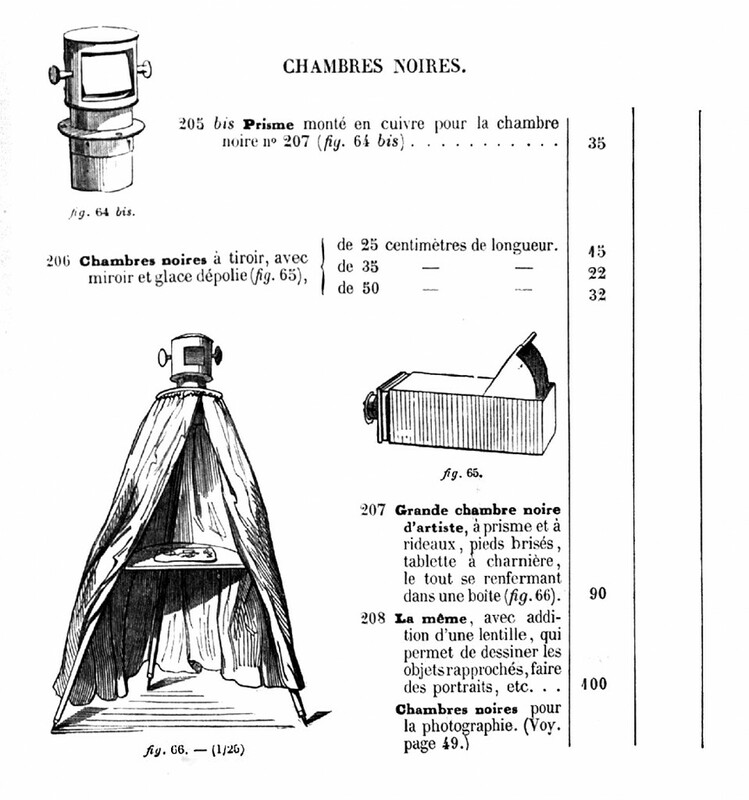 (Above) Lerebours et Secretan Scientific Instrument Catalog (1853). This catalog offers both a “field tent” for drawing landscapes (fig. 66, lower left) and a portable camera obscura box for small drawing (fig. 65, middle right). The box, which looks like a photographic camera, has an adjustable lens and ground glass to receive the image. The artist places vellum or other thin paper on the ground glass to trace the image. In this version, the artist has now left the dark chamber and works from the outside of the box. At this point in the mid-19th century, not only had the camera lucida been invented, both lucida and obscura were now joined by the photographic camera. But while the camera lucida feel into obscurity, the camera obscura still enjoys moderate popularity. Contemporary photographers like Abelardo Morell, Shi Guorui, and Vera Lutter make large obscura images then either photograph their findings or expose the obscura image directly onto light-sensitive paper. Camera obscurae also still exist as tourist destinations or curiosities, like the “Giant Camera” in San Francisco. Obscura: Known to ancient times, described by greats Mozi, Aristotle, Euclid, al-Kindi and others. Lucida: Invented merely 200 years ago by a Scot you’ve never heard of. And it disappeared soon after. The greatest thinkers, scientists, artists, inventors pondered the magic of pinholes and what camera obscura reveals about the nature of the universe. The greatest artist associated with the camera lucida is Ingres, but he never admitted it and the theory is controversial. Camera Obscura is a cool indie band. Camera Lucida is a book by Roland Barthes which is popular among college undergraduates. Making an Obscura? Block your windows and make a small hole. Magic! Take a box and put a pinhole in it. Magic! Making a Lucida? Wait for Pablo and Golan to study it and make it available because that prism ain’t in your kitchen cupboards. Using an Obscura: Well the room has to be really really dark. And then you have to let your eyes adjust. For quite a while. Then you can trace your image. Take your time; that image is still pretty faint. Your hand blocks the projection, so you have to draw sideways a bit. And the image is upside down and backwards, so thats’s confusing. And you’re still in the dark. OR you can make a box where the projection is on a ground glass surface, but then your paper has to be transparent or translucent because you have to trace the image coming through the paper. So that means the room still has to be pretty dark. And the scene you are drawing has to be fairly bright. Using a Lucida: Clamp it to your desk, look into the prism, trace what you see. Advantage and OVERALL WINNER: Camera Lucida! Because all that other history stuff is great and all, but you want something easy to use.